This vintage corkscrew in brass and steel was designed by Kay Bojesen in the early 1920s and manufactured by E. Dragsted in Copenhagen. The top of the corkscrew depicts a faun fighting a man over grapes. Vintage rabbit figurine or toy by Kay Bojesen. It was designed in 1957. This is an example from the 1960s fashioned out of oak. It has a rich and dark patina. Two piece teak salad bowl, produced by Kay Bojesen, circa 1955 Denmark. Fully signed "Kay Bojesen" "Denmark" and "TEAK". Measures: 9 1/4" tall x 10" wide. Teak serving tray from the 1960s, designed by Kay Bojesen Stamped on the underside: Kay Bojesen, Denmark, Teak St 834. Late 19th century sculptural, devilish love heart detail finger pull corkscrew, burgundy, France, circa 1890. Late 19th century sculptural, devilish finger pull corkscrew, Burgundy, France, circa 1890. 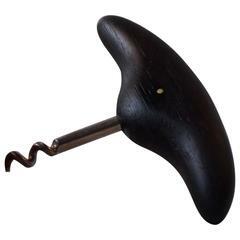 Antique German horseshoe design auto-puller corkscrew, circa 1920-1930.